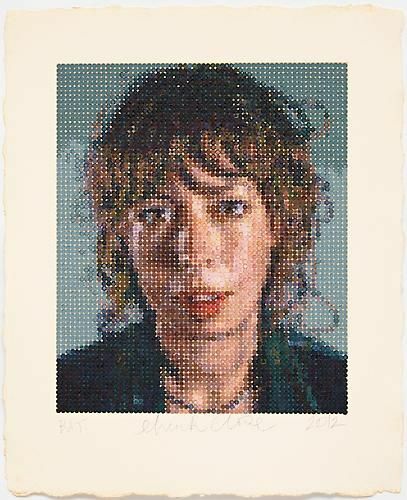 ADAMSON GALLERY is pleased to present an exhibition of recent work from Chuck Close. 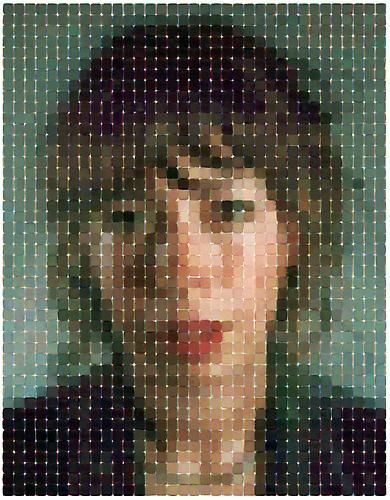 One of the most important artists working today, Close has been reimagining portraiture and reinventing media for over fifty years. 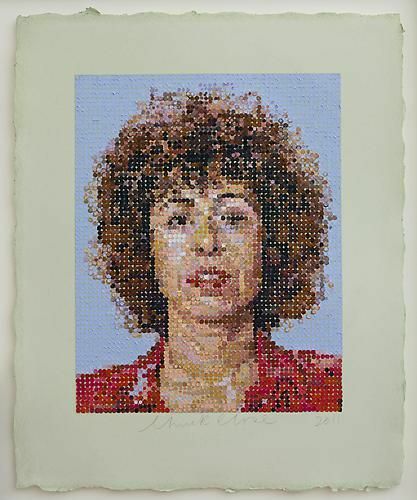 This exhibition focuses on two new bodies of work: Watercolor Prints and Felt Hand Stamps. 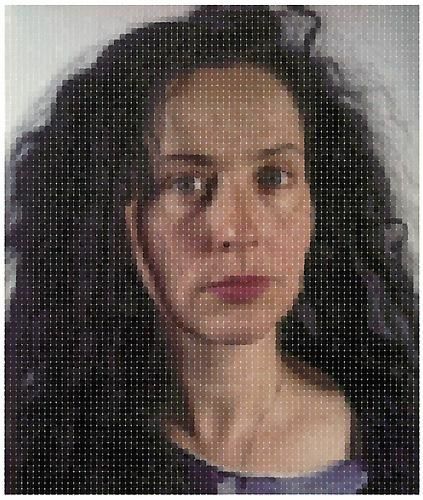 Each introduces a new technique; together, the two create a new conversation between the digital and the analogue, between the human and the mechanical. 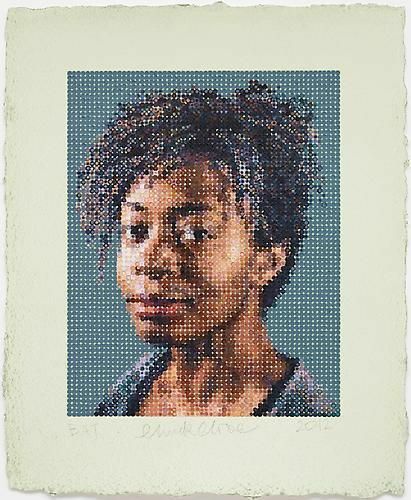 But they also continue another conversation, between Close and some of his longtime subjects: artists Kiki Smith, Cindy Sherman, Kara Walker, among others, who have been captured by Close as screen prints, as daguerreotypes, even as tapestries. 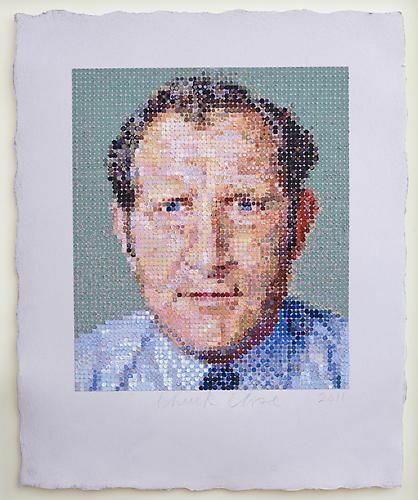 For Close, portraiture is an ongoing process that encapsulates both subject and medium. 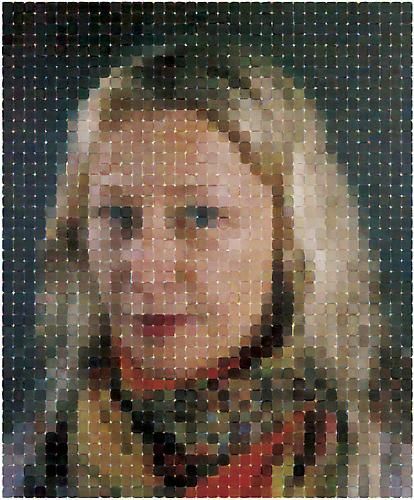 Chuck Close has long been a multimedia artist who is unafraid to explore new materials, or to turn the unexpected into a fine art medium. 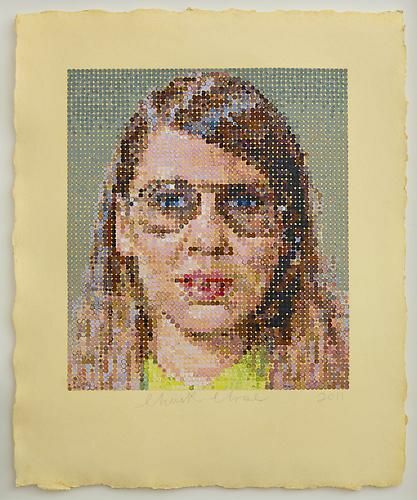 The Watercolor Prints represent Close’s first sustained engagement with the digital. 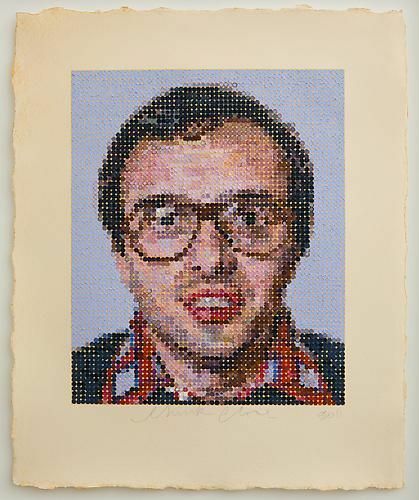 The basis of these images are almost fifteen thousand of Close’s own hand-painted marks, which are then individually scanned, manipulated, and reprinted in watercolor on watercolor paper. The resulting images are stunning—they communicate the fluidity and softness of watercolor, while still signaling something of the symmetry and regularity of the digital process. Through their monumental size, they invite the viewer to come closer, to inspect the process. 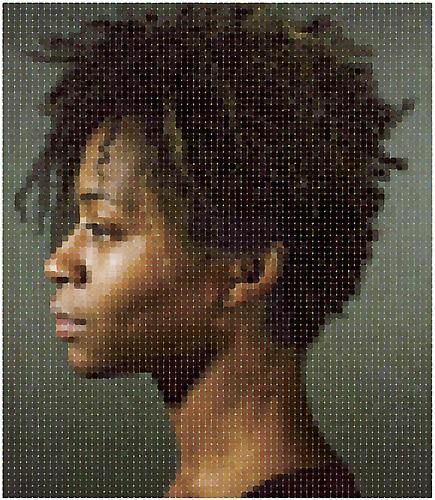 The Hand Stamp pieces introduce another imaginative and innovative new technique; one which is, in some ways, the direct inverse of the Watercolors. 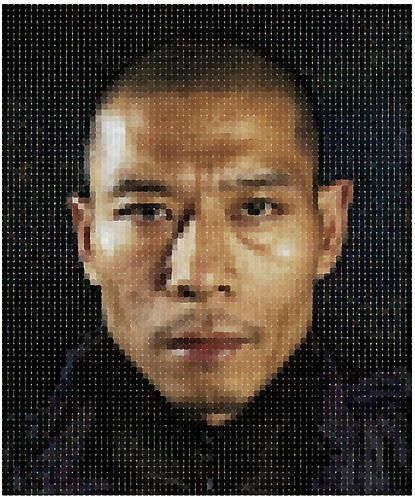 Each oil-painted image is made with hundreds of individual cylindrical felt stamps—each holding only one color. In order to standardize the placement of color, charts are used to guide human hands. The hand stamps are applied in three layers, rendering subtle interplay between shape and color: the oil paint is as textured as the watercolor is smooth. The results are rich pieces that again, stand between the mechanized and the handmade. 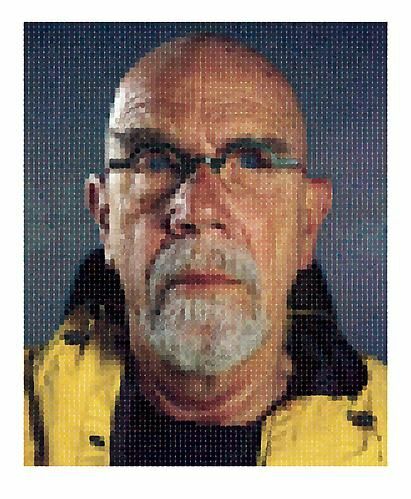 Over his long and impressive career, Chuck Close has been the subject of over 200 solo exhibitions in more than 20 countries. 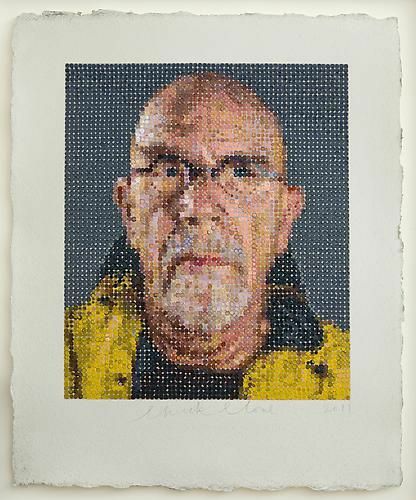 He is currently the subject of a survey exhibition documenting his innovative techniques entitled, Chuck Close Prints: Process and Collaboration, which, by October of 2013, will have traveled to eighteen venues, five countries and three continents. Close has also won numerous awards, among them the National Medal of Arts, which was presented to Close by President Clinton in 2000. He is currently serving on President Obama’s Committee for Arts and Humanities. 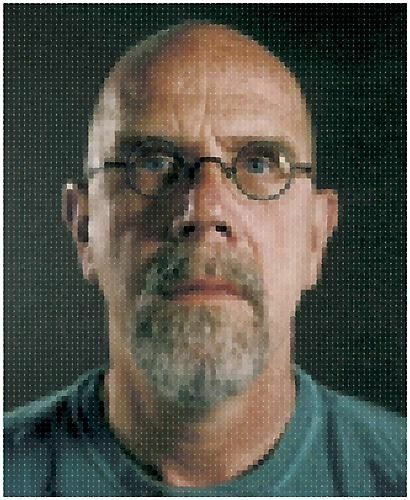 Chuck Close lives and works in New York City.